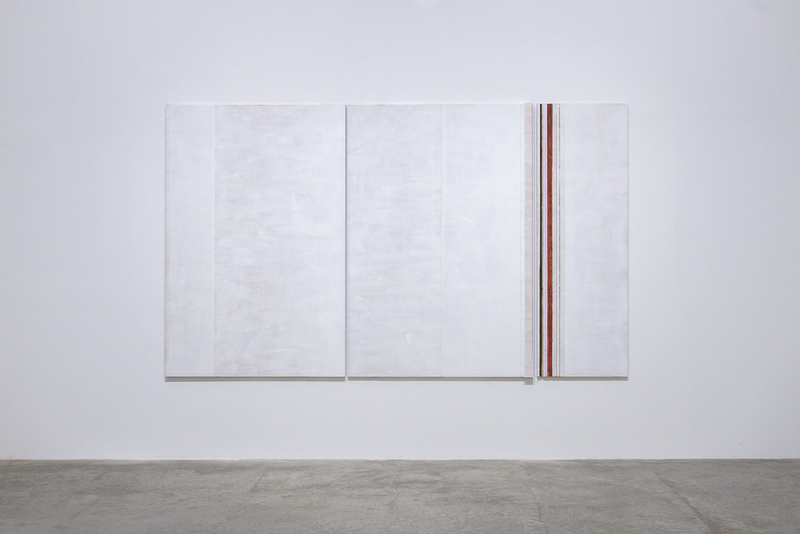 Melissa Kretschmer: Excavations, October 27, 2016 - April 29, 2017 ACE Gallery Los Angeles. Melissa Kretschmer featured in LA Art Show 2017, January 11-15, 2017. Contemporary painting often has set itself the task to transcend its own historical associations of representation. 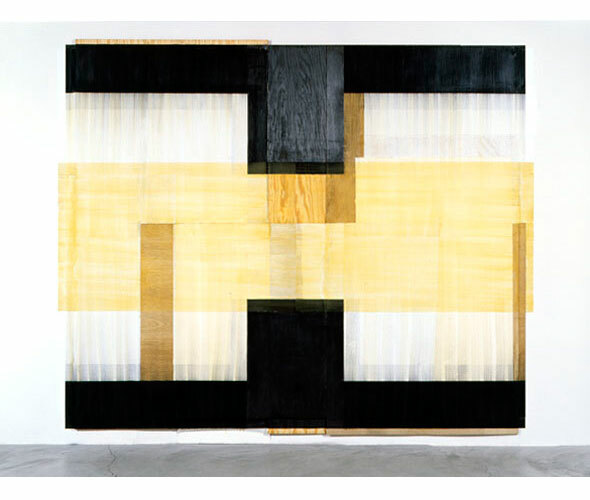 But aspirations to representational autonomy through geometric means have been frustrated by the problem of reference to the defined image field of the work itself (the canvas or panel), or by implied reference to the geometry of the surrounding architecture. 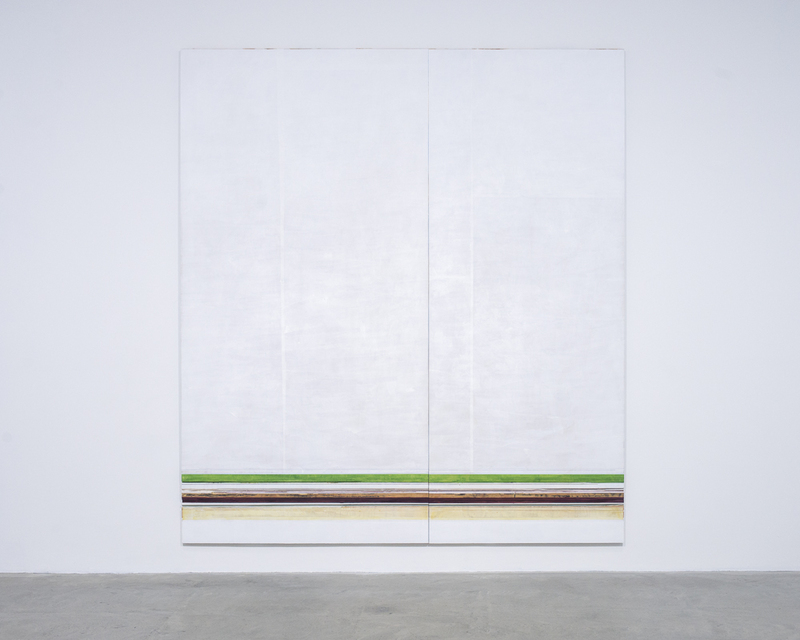 By a variety of means, Kretschmer’s work reconfigures the defined borders of the painting. First, she multiplies them and drives them to the center of the work. Through means both literal and illusionistic—or with combinations of each—she renders their edges indistinct from both their surrounding, and from contiguous elements of the work itself. 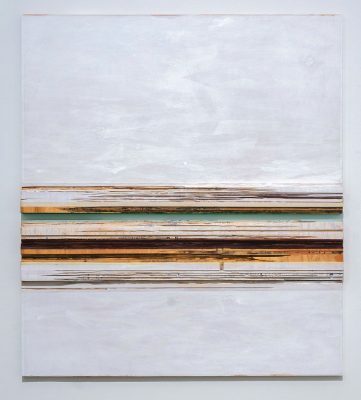 Her “excavations” or progressive exposures of underlayers of the work’s plywood substrate, combined with interventions of color and texture, seem to expose depths well beneath the surface of the wall behind them. Together, these strategies yield a work that, on the one hand melds with its environment; and on the other hand, because it nevertheless retains the integrity of a discrete object, entirely subsumes the environment in which it occurs. “Melissa Kretschmer, it seemed, had it all: engaging color stripes; surfaces she shaped with power tools; and panels, vertical and horizontal, in a range of sizes. She stole the show. 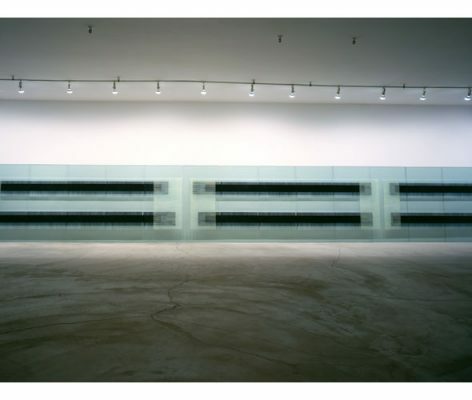 Years ago, her works might have been called specific objects. 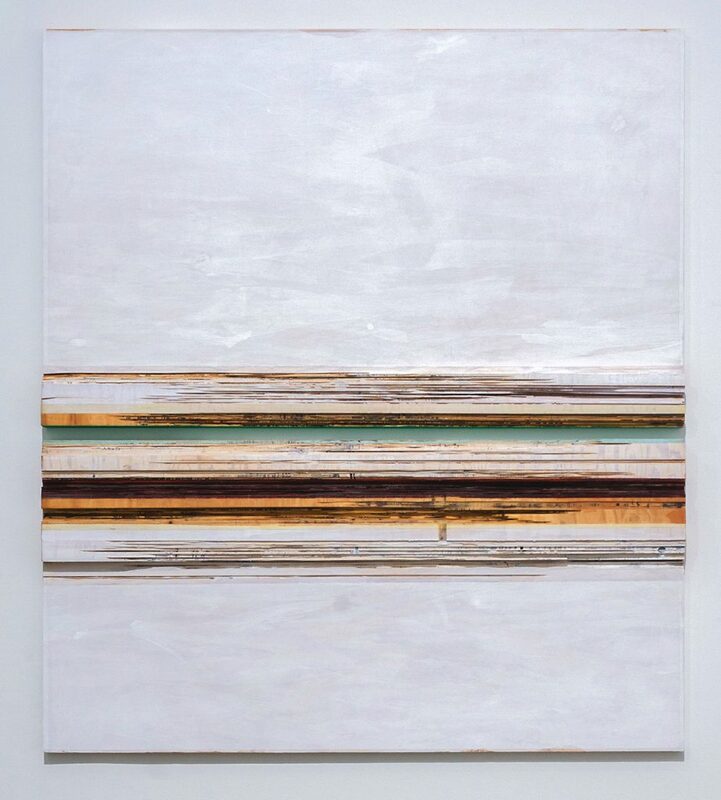 These days they are simply good, solid paintings inventively composed from vellum, gesso gouache, beeeswax, and plywood.” —Phyllis Tuchman, Artforum, January 2017. Kretschmer earned an MFA from the Art Center College of Design in Pasadena. 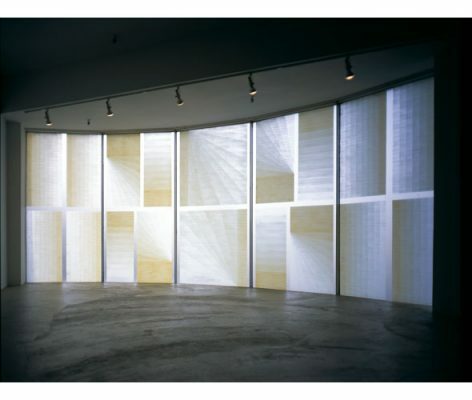 Her work has been widely exhibited since the early 90s. She has been the subject of museum exhibitions at the Boulder Museum of Art, Colorado; The Frederick R. Weisman Art Foundation of Pepperdine University, Malibu, California; and PS1 Museum, Long Island City, New York. 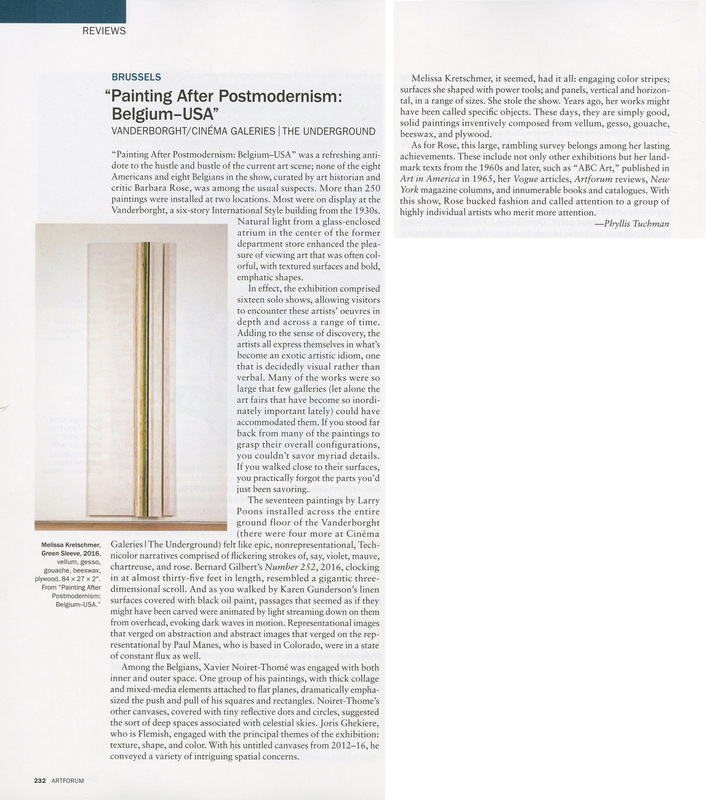 She was recently featured in Painting After Postmodernism: Belgium-USA, curated by Barbara Rose.